To all vegetarian people out there, here's another recipe thats good and delicious for you all. It's called pinakbet, it easy to cook and very very healthy. Try it now! In a cooking pan, heat oil and fry the pork until brown. Remove the pork from the pan and set aside. On the same pan, saute garlic, onion, ginger and tomatoes. Add the pork in the casserole and mix in the sautéed garlic, onion, ginger and tomatoes. Add in all the vegetables and cook until the vegetables are done, careful not to overcook. Thanks Jaye for inviting me for ex-link. Of course I'm glad to add you as my blogging friend! Oh so you always cook? It looks great! 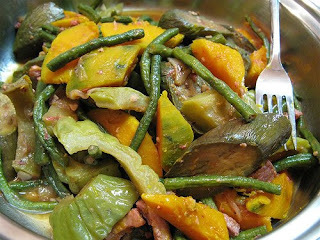 I don't like pinakbet but your picture makes it look delicious! Mmmmm!! !